Women are good at money managing skills, but when it comes to financial matters, many of us take a step back. The reasons could vary be it lack of time, lack of financial knowledge, lack of confidence, lack of interest, etc. It’s always said that behind a successful man there is a woman, but it’s a fact that every single life is incomplete without the presence and contribution of a woman in their lives. Women have always played their role by being a perfect daughter, wife, mother, friend or an employee. No nation, organization or a household could progress without the contribution of the women in the society. We have seen how women have evolved over time and crossed all gender biased borders to make themselves stand out. International Women’s day celebrates this zest and enthusiasm. But it’s time to pull your socks up and poke your nose in your personal finance matters and show your prudence in smartly managing your money.These financial tips can help you to manage your personal finance matters more progressively. Women are often tagged as shopaholics, but it’s a fact that the majority of women love shopping be it merchandise, jewellery, household, furnishings, shoes, bags, etc. With many e-commerce websites popping up offering heavy discounts, which are readily available almost throughout the year, the urge to buy more aggravates. But going overboard with your shopping spree with readily available plastic money or EMI options can diverge you from being a prudent spender to an extravagant spender. It does not mean that you kill your passion for shopping, but it is essential to draw a line between need and greed for shopping. Of course, one should indulge in the things which give you happiness (shopping could be one of those). But, it is also essential to manage your finances ideally and try to channelize them in a productive saving vehicle which could be a SIP, a fixed deposit, equity-linked investment scheme, endowment insurance policy, etc. Many women rely on their spouses for managing their finances be it financial planning, tax planning, investments or filling an ITR. It may include both working and non working women.There is nothing wrong with it but have you ever tried to contribute your ideas or managed to work it your own way? Women are not only good spenders but are good savers too. From being a great homemaker, women have excelled in all spheres. But when finances are concerned, they aren’t as confident and knowledgeable about financial matters as men. This problem persists even as women handle many of their families’ routine money management duties, like paying bills and making many purchasing decisions.Thus, it is important to be financially literate and take an active part in your own and your family’s financial decisions. Women are sensible savers, which many of us have witnessed recently during the demonetization drive. It was that time when our moms, aunts and some of us too also have come out with a substantial amount of savings which kept the men counterpart amazed. Also, we have seen unconventional piggy banks at our houses, in our childhood like a utensil in the kitchen, a box in the trunk, etc. With changing times and accessibility to the new investment or saving avenues, women should try out their hands on some investment options based on parameters like short term or long term investment, lock-in period; market-oriented or guaranteed returns based investment, etc. It is essential to channelize your money or savings into some productive investments instead keeping it idle at home or in a bank account. You may try your hands at periodic and steady investments which could help you to save money may be for an overseas holiday, for buying jewellery, for buying a car, or reinvesting your money. To begin with, one may take the help of a financial planner or a friend or explore the web to research about various investment options. All investments and savings will go in vain if your family is not adequately insured. Life insurance and health insurance are two main wheels of your life journey vehicle in today’s time. If we talk about life insurance plan, a term insurance plan for self and your spouse is the most crucial part of your financial plan. A term insurance plan is a pure protection plan which offers death cover in case of an unforeseen and untimely death of the person insured. The USP of these plans is that the premiums are very affordable for getting a high sum assured. There are special premium rates for females offered by almost every insurance company. However, most insurance companies do no offer term plans to housewives. The logic given is that since term plans are meant for income replacement, housewives technically do not qualify for these products as they have no income. A housewife, however, can take other endowment life insurance products like money back policy, a unit-linked insurance policy to name a few. But it is vital to ensure that the income earner in your family is adequately insured by a term plan so that your family is self-sufficient and financially independent in case of any unfortunate event. Illness, disease or an accident has always been uninvited and unwanted guests arriving in one’s life. These days getting treatment in a private hospital can take a toll on your savings. Treatment for critical illnesses like cancer or heart attack can act as a termite on your finances. Thus, in this era of rising medical inflation, having a health insurance policy becomes imperative to ensure a financial back up to combat any medical exigency coming your way. Don’t rely solely on the health insurance offered by your employer as it is intact till the time you are associated with that organization. It will untie the knot once you leave the company. With aggravating age, life and health insurance premiums also increase. It is prudent to buy it as early as possible. Saving for the rainy days is an old saying. Life is unpredictable and when will an untoward event knocks your door you never know! There could be situations which will pop up without a disclaimer like a sudden layoff in your organization, a medical emergency, loss in business, some unexpected tax liabilities, change in economic scenarios, etc. Such situations will have a financial impact on your fixed and routine expenses which calls for the creation of an “Emergency Fund.” The emergency fund is the periodic saving in the form of a reserve kept aside to help you financially during an uninvited financial exigency. Apart from all other savings and investments, it is essential to spare some portion out of your family’s income towards creating this contingency fund. The thumb rule says an individual must stash amount which is at least equal to sustain 3 to 6 months household expenses of an individual. You may park your money in fixed or recurring deposits, short-term debt funds, ultra-short term debt funds or other liquid investments which may earn you a decent and stable return, depending upon the type of instrument. Also, the most critical point here is the accessibility and liquidity of your money. So, it is vital to invest in investments offering lower lock-in period and non-risky returns. I hope these financial tips could evolve you as a smart saver and prudent spender to keep your financial frame strong and growing. 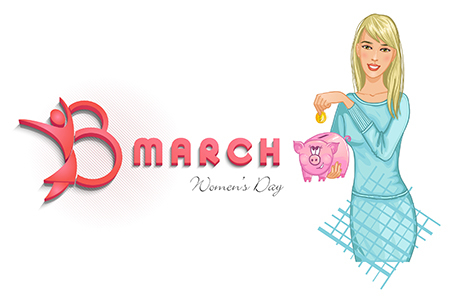 Wishing all women a very Happy Women’s Day!